Following movements toward urban farming, permaculture, and ecological urbanism, Detroit’s long-term vision, called Detroit Future City, charts the way to more a prosperous and sustainable future. Detroit Planners envision some neighborhoods remaining traditional residential, while others would evolve toward open land used for storm-water retention ponds, urban farms and energy production. Districts with high vacancy might transition to “green residential,” a mix of homes and small community gardens or parks. 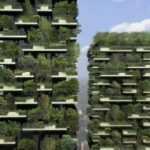 While abandoned neighborhoods might be used for reforestation or experimental fields where sunflowers and other plants could be used to detoxify contaminated land. Detroit Works, the long-term planning vision for the long-rusting Motor City, embraces the urban farming, permaculture, and ecological urbanism movements, to chart the way to more a prosperous and sustainable future. It calls for re-connecting with the land, uniting residents toward the common good of raising healthy food in tree-lined walkable neighborhoods. Connected by multi-modal transportation, it sets forth a suite of productive land uses to elevate the disabused squalor of the urban “legacy” of our collapsed industrial environments. 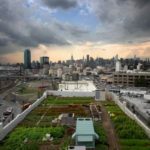 Recent studies suggest that urban farming and greening strengthen community bonds and reduce violence. Take, for example, Philadelphia’s 54,000 vacant lots in 2000, of which the Pennsylvania Horticultural Society reclaimed 4,400 of them, planting trees and gardens and providing long-term upkeep. Over the next ten years, the greening of these parcels encouraged more neighborhood diligence to combat crime, leading to reduced shootings in the areas surrounding these renewed lots. Urban Roots, a documentary from Tree Media on reclaiming neighborhoods through urban farming in Detroit. Produced by Leila Conners and Mathew Schmid and directed by Mark MacInnis. Food Field, a new urban farm on four acres in Detroit’s Durfee neighborhood, between Boston-Edison and Highland Park. Detroit is possibly the most famous example of a city with an excess of newly vacant and neglected land in need of regrowth and reinvention. Their well-publicized economic collapse, with blighted, partially-demolished neighborhoods, represent the decline and outsourcing of the US automobile manufacturing, as well as myopic public policies and racist white-flight to the suburbs. The city saw their 1950 population of 1.8 million spiral downward to 714,000 today, leaving behind massive unemployment, poverty, and crime. Some of Detroit’s population loss can be attributed to the exodus of middle-class blacks unwilling to subject their children to substandard and underfunded schools, and crime in the relatively affluent neighborhoods that remain. A similar black middle-class exodus has occurred in legacy cities such as Chicago, Baltimore, Philadelphia, and Atlanta. Reforestation and greening to stabilize existing neighborhoods. Neighborhoods suffering from chronic joblessness and poverty see the employable population depart for greener pastures, so to speak, leaving behind the less-educated and infirm, resulting in endemic hunger, drug abuse, and violence. Hence, the alleys, fields, vacant houses and abandoned garages become trash dumps and breeding grounds for crime. Urban farming and reforestation reclaim these lands and inspire the remaining population to take pride in the area. 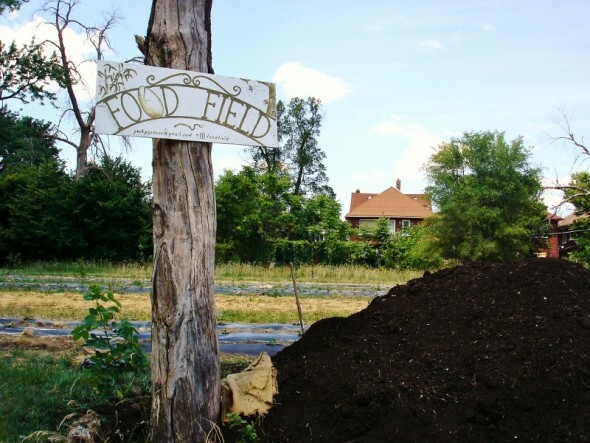 D-Town Farms: After a couple of experiments on the East Side of Detroit, in 2008 the Detroit Black Community Food Security Network (DBCFSN) created a two-acre model urban farm in the City’s Rouge Park. The acquisition resulted from two years of meetings and negotiations with the city’s management, obtaining a license agreement to use the site for $1 annually for ten years. Using sustainable, chemical-free practices to grow and sell organic vegetables. The farm includes plots, bee hives, and a hoop house for year-round food production. Now, Mayor Dave Bing’s city government is pushing Detroit Works, a long-term plan that would codify the myriad of farming, greening, and innovation that will stabilize the downward spiral and chart a course toward long-term environmental and economic sustainability. The typical United States real estate paradigm for growth and development has failed Detroit, which paved over prime agricultural land and open prairie wetlands with houses, strip malls and freeways, not allowing space for parks, flowing streams, nor ecological biodiversity. As discussed by the American Planning Association’s “Sustaining Places,”a shrunken Detroit now demands planning for a livable built environment, harmony with nature, intergenerational equity, community health, authentic engagement, and economic resilience. Urban Permaculture – A Way Forward: Fresh high quality food is difficult to come by in US industrial centers, especially in poor communities of color, sometimes actual “food deserts.” Businesses that operate in these centers, facing financial difficulties themselves in neighborhoods that might have as high as 50 percent unemployment, do not always cater to local residents’ best interests. Permanent Agriculture (permaculture) is an approach to designing human settlements and agricultural systems that emulate ecologic relationships from wild nature. It is a land use and community building movement focused on harmonious and sustainable integration of human dwellings and food production within the broader context of the micro-climatic, hydrological and biological landscape. Of course, farming takes do-it-yourself work, as yet not even sanctioned by city codes in most municipalities. It is not for the faint of heart. Irrigation costs money, and the stress on growing things in this heating climate is considerable. It is not an easy choice, but is proving in Detroit to work. Detroit’s Urban Prairie calls for some productive long-range planning through Detroit Works. Vacant Land. Of Detroit’s 35 square miles of open space, 20 square miles are vacant or underutilized. With market demand for urban core property perpetually depressed, the city seeks to create new interest. At current reduced densities, tax revenues are a fraction of what they once were. Remaining inhabited houses experiencing financial stress could become vacant en masse, slowly degrading to the point of demolition, if nothing is done to stabilize the city. The number of vacant housing units doubled between 2000 and 2010. Hantz Farms – A Cautionary Tale: Financial services magnate John Hantz seeks to establish a 10,000 acre private farm in Detroit, offering to buy up over 2,000 empty lots from the city of Detroit. Hantz plans to grow trees instead of food, with the first step a 200 acre reforestation project. In the short run, it would clean up the neighborhoods, relieve the city of the tax burden, and create a few jobs. Over the long-run, the plan seems more of a real estate land grab, intending to bid up the cost of land by taking massive swaths off the market, though the cost-benefit is locally controversial. In the future, Mr. Hantz would profit greatly off of what is now a public good, with little upside for the low-income communities of Detroit. Multi-Modal Transportation. Detroit is a sprawling mess that must be re-imagined with mobility options that don’t include the city’s most auspicious income-generator and symbol — the car. Reinventing the economic viability of historic neighborhoods of greater downtown, including Corktown, Midtown, Eastern Market, and Lafayette Park should include connecting them sustainably, quickly and inexpensively to employment opportunities with suburbs of Ferndale, Royal Oak, and Birmingham, as well as the wider Detroit Metro Area. This could include new streetcars, light rail or long-distance rapid buses. This also will encourage suburbanites to patronize new offices and shops downtown, and increased residential densities throughout. Detroit: Green A documentary on the urban farming movement focusing on Detroit’s Earthworks Urban Farm, a project by the Capuchin Soup Kitchen. Earthworks Urban Farm: In 1997, Capuchin Franciscan Brother Rick Samyn started a garden at the Capuchin Soup Kitchen, which feeds the hungry and cares for the poor in downtown Detroit. Together, these two visions formed a need to address the systemic causes of poverty, broken relationships and a wounded Earth. Earthworks was born. The response was overwhelming and positive. Brother Rick began Earthworks on a very small plot of land on the corner of Meldrum and St. Paul. In 1999, the garden expanded in collaboration with Gleaners Community Food Bank onto lots at the new site for the Capuchin Soup Kitchen. They added a 1,300 square foot greenhouse for vegetable seedings and currently serve fresh produce at the soup kitchen as well community potlucks and youth stands at farmer’s markets. City Planners envision some inner-city neighborhoods, like Indian Village or Palmer Woods, remaining traditional residential, while others would evolve toward open land used for storm-water retention ponds, urban farms and energy production. Districts suffering considerable vacancy might transition to “green residential,” a mix of homes and small community gardens or parks. While entirely abandoned neighborhoods might be used for reforestation or experimental fields where sunflowers and other plants could be used to detoxify contaminated land. 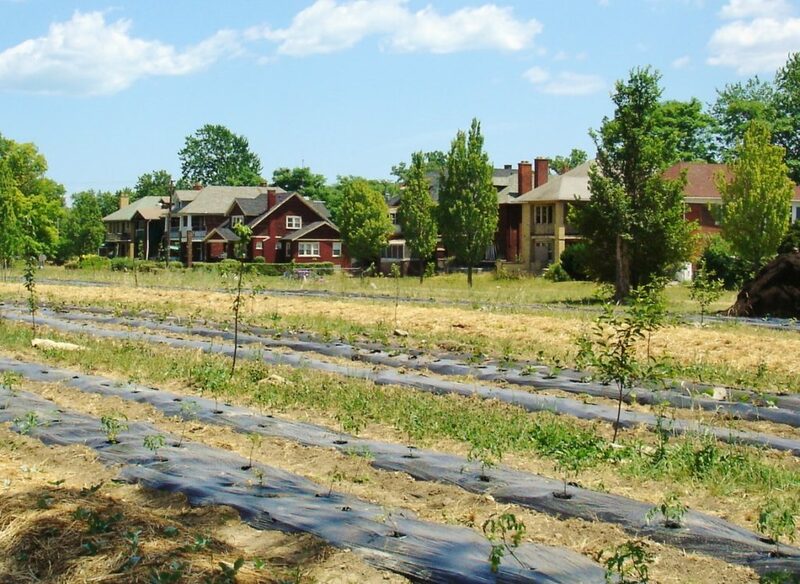 Cultivated landscapes: including a range of community gardens, orchards and large-scale commercial greenhouses producing healthy fresh food for Detroiters. Food Field Detroit: A new urban farm on a four acre former school site in Detroit’s Durfee neighborhood, that since 2011 has produced several thousand pounds of organic produce, built relationships with local chefs and neighbors, raised a large hoop house for year-round growing, and hired an intern and neighborhood teens. Their goal is to build a sustainable business feeding Detroit, while creating real alternatives to the corporate food system. This brings jobs, resources and benefits back to the community. Innovation Landscapes: A range of uses that will generate revenue, clean soil and test new ideas such as research and remediation fields, artscapes and alternative energy production. Empty factories could become “live-make” spaces for artists. One of the most important of these is an urban conceptual art installation called the Heidelberg Project, began in 1986 by artist Tyree Guyton and a host of family and friends. Natural Landscapes-Blue-Green Infrastructure: A range of emergent and guided landscapes and water features providing ecologic and economic benefits and functioning infrastructure systems for Detroit. Some vacant fields could become greenway recreation paths, rainwater retention ponds, and other “blue-green” infrastructure. Note the Detroit RiverWalk plan to develop pavilions, plazas, parks and green space on five and a half miles of riverfront from the Ambassador Bridge to just east of the MacArthur (Belle Isle) Bridge. “Detroit Works Project – Long Term Planning,” City of Detroit.